Jeff MacSwan is a Professor in the Department of Teaching and Learning, Policy and Leadership (TLPL) at the University of Maryland-College Park, and is also an affiliated faculty member in the University of Maryland Linguistics Department. 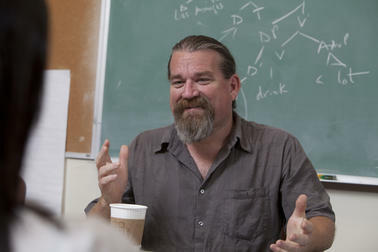 He previously served as Professor of Applied Linguistics and Education at Arizona State University, and was the founding Director of ASU’s Applied Linguistics PhD Program. MacSwan’s research focuses on the linguistic study of bilingualism and codeswitching, on the role of language in theories of academic achievement differences among language minority students, and on education policy related to English Language Learners in U.S. schools. He is editor of the International Multilingual Research Journal, and currently serves on several editorial boards. Examples of MacSwan’s work appear in Bilingualism: Language and Cognition, Lingua, Hispanic Journal of Behavioral Sciences, Teachers College Record, Education Policy Analysis Archives, and in edited collections. In 2003, he was selected as a National Academy of Education/Spencer Postdoctoral Fellow. NEPC Review: Has Progress Been Made in Raising Achievement for English Language Learners? NEPC Review: Immersion, Not Submersion, Vol III: Can a New Strategy for Teaching English Outperform Old Excuses?